WASHINGTON (AP) For weeks, the Washington Wizards have been hearing about their struggles against teams with losing records. Now that they’ve won two straight and elevated their record to 11-10 against sub-.500 teams, perhaps they’ve taken a step toward ending that discussion. ”We’ll find out in the next 10, 20 games,” Washington center Marcin Gortat said. 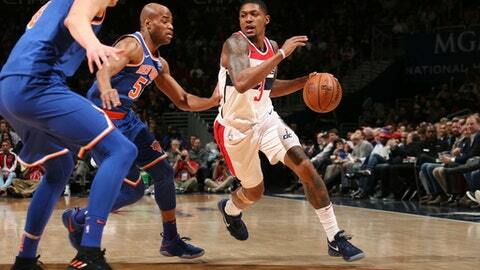 Gortat had a season-high 21 points, making 9 of 10 from the field, Bradley Beal scored 27 and John Wall had 25 points and nine assists in the Wizards’ 121-103 win over the New York Knicks on Wednesday night. Playing for the first time since he was named Eastern Conference Player of the Week, Beal followed his 39-point outburst on Sunday against Chicago by hitting 11 of his 14 field goal attempts for Washington, which has won five of six. Beal has answered plenty of questions about the Wizards’ lapses against the NBA’s bottom-feeders. Michael Beasley had 20 points, including 16 in the second half, to lead the Knicks, who have lost six of seven. Kristaps Porzingis scored 16 points. New York has lost 14 of its last 15 to Washington. In an energetic first half that ended with both teams shooting 58.1 percent, Wall’s jumper at the horn gave the Wizards a 64-63 halftime lead. The first seven Washington baskets in the third quarter were from inside, and the resulting 15-3 run gave the Wizards a 79-66 lead with 7:47 to play in the quarter. The Knicks lost at home against San Antonio on Tuesday, and they had little energy after halftime. Knicks: G Ron Baker returned to the lineup after missing a game with a left orbital fracture. Baker donned a protective mask, and he expects to wear it for at least four weeks. Wizards: F Chris McCullough was assigned to the Wisconsin Herd of the G League. McCullough is averaging 3.0 points and 1.7 rebounds in 12 games. … F Mike Young, who was signed to a two-way contract last spring but never played for Washington, was waived. … The Wizards (22-16) are a season-high six games over .500. . F Markieff Morris tied a season high with 11 rebounds. Beal knows Washington’s 3-1 week helped win him his first Player of the Week award. Gortat entered the game averaging 8.6 points per game, and hasn’t been as much of an offensive force for the Wizards as he’s been in the past. ”It’s just one game in the season where I’m going to score like that,” Gortat said. Porzingis, who entered averaging 24.1 points per game, had a rough second half. He had just two points in 17 minutes, missing five of six shots. ”He’s got to use his athletic ability running down the court, and we got a little slow there for a while,” New York coach Jeff Hornacek said. Wizards: Visit the Memphis Grizzlies on Friday.